Jericho Rosales, Six bands performing and many more! 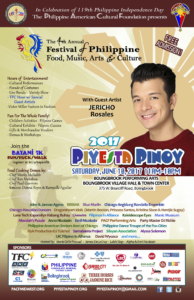 CHICAGO, May 12 – The greater Chicago’s biggest Filipino American festival, in celebration of the Philippine Independence Day, returns to Bolingbrook for the fourth year this summer. 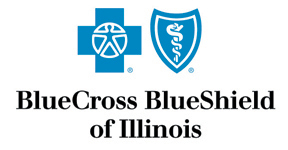 Join us for a massive 11-hour festival, Saturday, June 10, 2017 from 11 a.m. to 10 p.m. at the sprawling Bolingbrook Performing Arts Center, next to the Bolingbrook Village Hall and Town Center. Piyesta Pinoy, or Philippine Fest, is as annual celebration and showcase of Filipino heritage and culture. 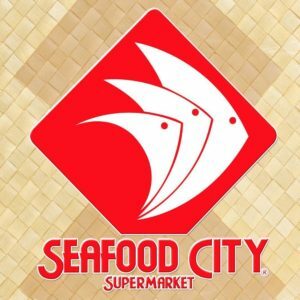 It features a variety of cultural and fun activities for all generations – live music and dances from both contemporary and folk performers, authentic Filipino cuisine, cultural exhibits, arts & crafts, train ride, rock climbing, pabitin and other children’s games, a costume parade and other children’s activities. New this year is the 5K Run, Ruck nd Walk starting at 9 in the morning. To join, register here: bit.ly/bayani5k. This year, Piyesta Pinoy Bolingbrook is expecting to attract an even bigger crowd as we welcome The Filipino Channel celebrity from the Philippines as our special guest – Mr. Jericho “Echo” Rosales. We are also very excited to announce the fantastic lineup of the bands that will be performing for us this year. 1. Kaleidoscope Eyes – a Beatles Tribute Band with a Filipino American lead singer; 2. Sama Sama Project – Filipino Folk Fusion Music; 3. Manic Museum – Alt-Fun-Rock Band; 4. Live Wire Band – Inspired Kids Rock n Roll Band; 5. Messiah’s Puzzle – Journey cover band; 6. Blue Marlin – Blues, Reggae, OPM, Rock. The cultural performers will be opening the program at the main stage starting at 1130am. The cultural lineup includes the Chicago Angklung Rondalla Ensemble,, National Anthems by Emil Nicolasin and Louella Cabalona, BIBBAK Illinois, Lane Tech Kapamilya Habang Buhay , Philippine Dance Troupe of Fox Cities, Philippine American Cultural Foundation Performing Arts, Pilipino American Seniors Association of Chicago, UIC FIA Cultural and the Silayan Association. Also performing are John and Jannae Agena, Chicago Hawaiian Dancers, Dragon Heart Idols, Anna Nicolasin, Alyssa Solomon, David Wycoco and the Victor Miller Fashion in Fashion. The emcees are Alpha and Emil Nicolasin, Lakhi Siap, Girlie Pascual and James Dela Cruz. Providing DJ music at the mini stage are two of the most popular DJ’s in the Chicago area – Party Master DJ Richie Gil and DJ TUKMOL Rommel Gaspar. There will also be more vendors, not-for-profits, business and service providers who are joining the piyesta this year. We will have at least ten food vendors selling all sorts of Filipino favorite foods from adobo, lechon, barbecue and pansit to halo-halo, Magnolia ice cream and empanada.